BOSTON, MA--(Marketwired - September 08, 2016) - Driven by faster development of commercial applications, the market for carbon nanotubes (CNT) will grow to $560 million in 2025, while graphene will lag at $305 million, on account of slower adoption in energy storage, according to Lux Research. The success of CNTs comes mainly from the use of multiwalled nanotubes (MWNTs) as a superior replacement for carbon black, rather than as a super-strong material or for ultra-fast electronics that many developers have long dreamed of for this "wonder material." "The CNT market can now support a few pure-play materials suppliers, but the overall state of the market remains oversupplied," said Anthony Schiavo, Lux Research Analyst and lead author of the report titled, "Carbon Nanomaterials Update 2016." "Developers finding ways to ease adoption with more convenient form factors and intermediates has been key," he added. "The less a product resembles a nanomaterial, the more likely it is to succeed." MWNTs are tapping the Li-ion market. MWNTs have emerged as an alternative to carbon black in conductive composites with applications in fuel lines and packaging for electronics. They have also gained a firm foothold as an additive for Li-ion battery electrodes. Continued growth to 12,500 tons in 2025 will come from price reductions. Composites are key for graphene as new applications are tested. Composite applications will be the largest user of graphene through 2025, as the market grows to 7,500 metric tons amid a slowdown in energy storage. Emerging areas of growth include sensors and water, where companies such as G2O Water have used graphene derivatives. New form factors are winning. 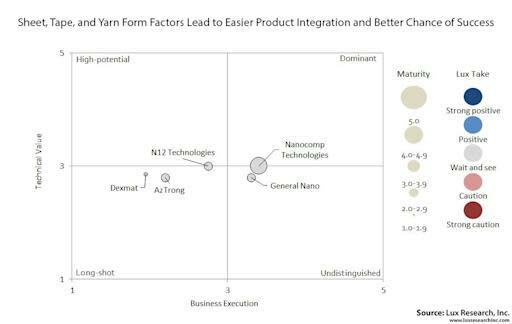 Sheet, tape and yarn form factors are leading to easier product integration, raising chances of success. CNT yarns and sheets producer Nanocomp Technologies was the sole company to be ranked "Dominant" on the Lux Innovation Grid; N12 Technologies, which develops vertically aligned CNT sheets, was rated "High potential." The report, titled "Carbon Nanomaterials Update 2016," is part of the Lux Research Advanced Materials Intelligence service. To hear more about carbon nanomaterials, listen to the Lux Research podcast, "Carbon Nanomaterials: Carbon Nanotubes and Graphene."